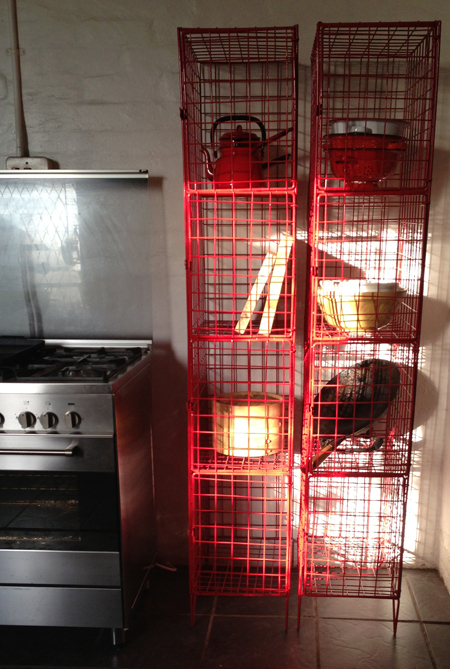 Look what arrived yesterday, two lovely red lockers for the kitchen. They are replacing a horrid built in unit that was shifted when we got our new stove, the unit was wonky because it was no longer fitted and gathered all kinds of abominable dirt and noonoos. The kitchen is our most favourite place in the house and unfortunately needs the most work. The floor tiles are not our style and because of the stretching and shifting of an old house have popped up. We are going to remove them all, and clean then seal the lovely cement floor underneath. Have to focus on the MESSY STUDIO for now, so red lockers are to soothe my itchy kitchen renovation fingers.